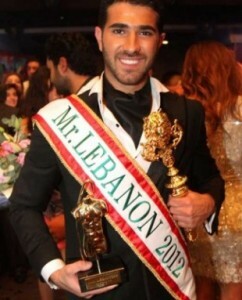 Rodolphe Abi Nader wins Mr. Lebanon 2012 title! Mister Lebanon 2012 contest was held at the Regency Palace in Adma where 16 candidates competed for the title. The winner Rodolphe will represent the country in the next edition of Mister World pageant. Gracing the event as a performer and one of the panel of judges was Haifa Wehbe, a popular Lebanese model, actress, and singer.